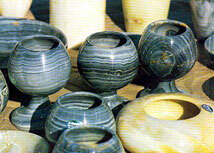 There are substantial onyx reserves in central Anatolia. Onyx occurs in a variety of beautiful colors ranging from black and gray to cream and pink. Attractive pieces such as chess sets, boxes, bowls, ash trays and vases are widely available at reasonable prices in Turkey.